This month, Splitsville Orlando celebrates its second birthday. The "luxury lanes" first opened to the public on December 19, 2012 at Downtown Disney, raising the bar for modern-day bowling alleys. But you might be surprised at what you're missing if you haven't had dinner at Splitsville! This isn't your parents' bowling alley! This mega-complex is 50,000 square feet of entertainment, featuring 30 bowling lanes, pool tables, 5 bars, and more than 70 flat-screen televisions, spread out over two floors. Food service is offered in the scattered dining room areas, at the bars, and even at the lanes, for those wishing to get a game in as well. Both indoor and outdoor seating options are available. 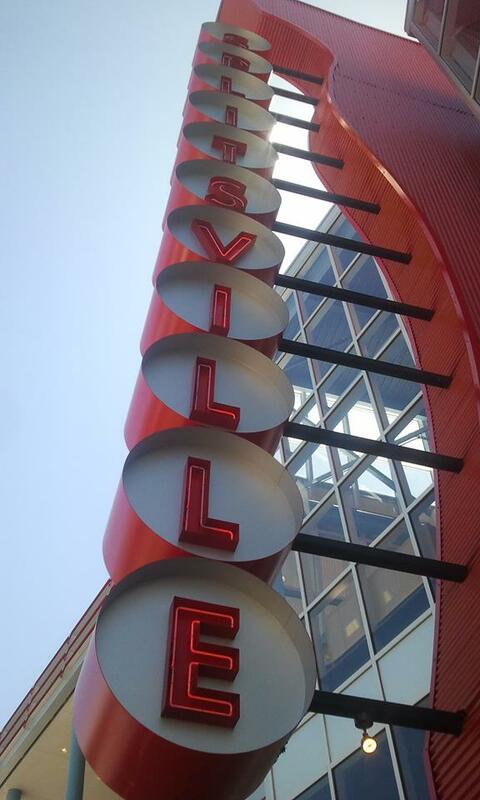 When you first enter Splitsville, there are signs that direct guests to check-in areas for either bowling (with a dining option), or dining only. With five guests for dinner on a Friday night, I must admit that I was pleasantly surprised to be seated without delay. I wouldn't expect this to be the norm for Splitsville - or any Downtown Disney restaurant, for that matter - reservations are never a bad idea! Even though we were seated in a dedicated dining area, it was an open area, and we were sandwiched between two sets of occupied lanes. I expected to develop a headache before I even placed my drink order, but the thunderous claps and crashes actually faded into the background after a few minutes. 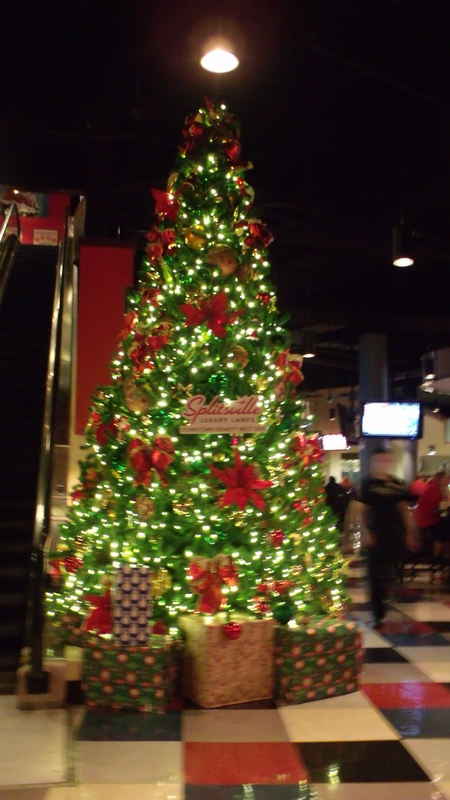 Previous dining excursions to atmosphere-heavy restaurants like Rainforest Cafe and T-Rex have left my chatty companions frustrated, but we were able to successfully gab our way through our dinner experience at Splitsville. We were only distracted by the occasional cheer from a proud bowler after a well-tossed ball, and this quickly became an endearing part of the contagious charm of Splitsville. Another aspect of that charm was the general appearance of the entire building. Inside and out, the theme seamlessly combines upscale sophistication and simple nostalgia. it really is one of the more attractive venues at Downtown Disney, and the layout is very accommodating. Live musicians are a regular fixture here on the outdoor patio, as an added bonus. Splitsville is taking bowling alley edibles to a whole new level, with a menu that commands a double-take. The combination of categories alone is cause for pause... seafood, pizzas, burgers, sushi... Sushi? From a bowling alley? Our server was quick to take notice of our collectively crinkled noses and furrowed brows. He acknowledged the unusual menu inclusion, but enthusiastically boasted about the high-quality selections (11 in all), freshly-rolled, by hand, in the on-stage kitchen. But, don't be fooled! Even the standard bowling alley menu items are anything but mundane at Splitsville! A prime example - the Juicy Lucy! This is the grandaddy of hamburgers: two burger patties (made from three kinds of beef), smothered in cheese, special sauce, and all the usual toppings. As soon as I laid eyes on this behemoth, I realized I had bitten off more than I could chew. And on the topic chewing... my mouth simply isn't big enough for this! This one would demand a fork and knife! I think I made it to the halfway mark in my attempt to devour the Juicy Lucy. Two of us ordered this one, and easily agreed that it was one of the best hamburgers we had ever had - cooked to perfection, ooey, gooey, and yes - juicy! Considering the mountain of fries served with the sandwiches, I'd have to recommend focusing on the star of the plate instead of loading up on the spuds. While I obviously wasn't able to sample the menu, I certainly took the time to make observations. Every menu item that made its way from the kitchen to neighboring tables looked incredible. Nothing was even remotely skimpy, and everything appeared downright delicious. We also had a pizza in our order, as well as chicken tenders from the kids' menu. Mind you, the "kid" was 18, but she tends to prefer smaller portions. If you're not a big eater, the kids' portions may be worth considering. Keep in mind, however, this menu is very limited. 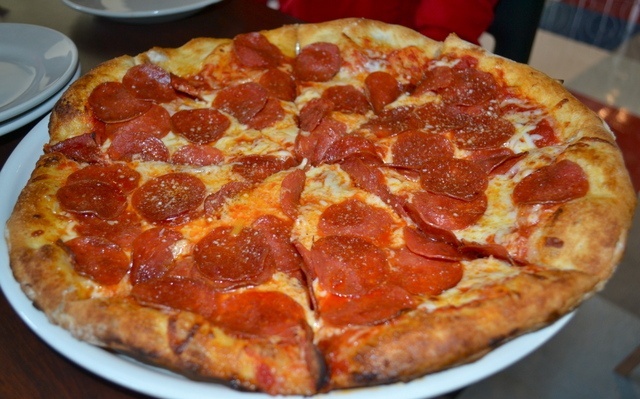 The hand-tossed pizzas measure up to equal a standard medium pizza at most pizza chains. My teen son powered that one like a champ, but it easily could have fed two less-gluttonous guests. I suppose that was our general consensus - the food was too delicious to avoid over-indulgement! Speaking of indulgence... as impossible as it seems, save room for dessert! There are only a few selections on the dessert menu, but they're irresistibly enticing. On second thought, with names like "Super Sundae" and "Giant Cake", perhaps it's more realistic to plan another visit just for dessert! If you'd prefer a guilty pleasure of the beverage variety, Splitsville has a collection of frozen drinks, martinis, bowl drinks, and a reasonable wine list. The Snickertini has to be the most alluring of their specialties. Non-alcoholic options include Icees and Coca-Cola Freestyle. For guests opting out of excess, rice bowls, salads, and even gluten-free menu items are available as well, so decadence is not necessarily required (only encouraged). Splitsville does accept the Disney Dining Plan (Table Service option). Servers are attentive, upbeat, and very knowledgeable when it comes to the menu. Advance reservations for both dining and bowling are available, and recommended whenever possible, but it's also a location worth looking into as a last-minute option. Lunch service tends to be a bit more subdued and less crowded. Prices are fair, by Disney standards, but drinks can be costly. Two double bourbons in our order totaled $40 (high by my standards), but specialty cocktails and bowl drinks are good deals, and often on special. Dinner packages are typically available, combining dinner with lane rental, or nearby shows like Cirque du Soleil. View the complete Splitsville menu here.